BIG BROTHER 10 AND MY ALMA MATER? So tonight I am waiting on some friends to come over and I turn on the TV. Big Brother 10 was on (which I have never watched and don’t care about) and this girl is in the interview chair and all the sudden it clicks. I know that girl, I went to high school with that girl. It was Keesha Smith who was a senior when I was a freshmen. Here is her bio on CBS.com. Now some of you are from areas where people always make it on TV or become famous and that has happened by people from my county, but lets be honest it doesn’t happen to people from my high school or Sterling, OH very often. We had some girls make it to Jerry Springer once and the creator of the Ninja Turtles is our most famous alumni, but this was the highlight of my evening. I know it isn’t a big deal but I was just so thrilled that I noticed myself and put it all together. I still maintain that spotting people (like mildly famous people in public settings) is one of my gifts that isn’t really worth anything. I am sure it was/is/has been news back in Wayne County and made The Daily Record front page but my mom never told me about it so I found it fascinating. I realized the other day that I left a cliffhanger a couple months ago when I asked if anyone had ever heard of the xp3 curriculum and if they were using it. (It is the merging of Reggie joiner’s 252 basics children’s curriculum and Andy Stanley’s 7 checkpoints.) When I first heard that they combined I was intrigued and this stuff does not disappoint. We have decided that our student ministry would go with it this fall. So 3 months later there is my follow up post. Worship-This happens in our Wednesday night services. As I already mentioned we are going with the XP3 curriculum and I am excited. It is a complete evening in a box from start to finish. From games, to worship songs, graphics, videos, themes, and lessons it will help me spend my time on equipping and managing people rather than coming up with conceptual stuff from start to finish. Wednesday nights are also getting a boost as our worship hits another level. We have some guys who are going to invest in this group and take it to the next level both in leadership, time, and technical expertise that I was unable to do amidst the forest. We also have some adults who make this night work from registration, to food and atmosphere, and even working the room as social butterflies. Grow-This happens in our Grace Groups that meet during the week and one during middle hour. We have some awesome, capable, enthusiastic adults who will 3 guys groups and 3 girls groups. These groups will also be stocked with student leaders. Grace groups are groups where transformation happens through biblical truth, caring relationships, prayer, and accountability. Serve-HSM students serve on Sundays during services and especially during Middle Hour. There are many ministries that fit a rang of gifts and personalities, such as Upstreet Live (a full acting production for k-5), Waumba Land (puppet program for preschool), Tech crew, Ushering, Nursery, and working with The Zone (middle school), or with children’s ministries Adventure Alley during 1st and 2nd service. HSM will also have serve Saturday’s monthly in a array of different places to serve as a high profile doorway into service opportunities. Outreach-This happens through personal relationship “one person at a time” (as our church and ministry vision say). We will teach, program, and encourage that outreach happens and our Wednesday night worship will always be sensitive to new people. This completes the cycle of our 4 values. We will also have special events to interject life into personal outreach such as this weeks food fight launch, a couple concerts, and March’s dodgeball tournament. Hope this all made sense. It is not perfect, but that is where our ministry and church are right now and the philosophy we are built around. Well the school year is officially underway! HSM and The Zone launched the fall with our 3rd annual food fight tonight. It is always a wild night to say the least, but it helps us regroup and attract a crowd. Here are some pics that Jheff took. Tomorrow we will finish cleanup and let the dust settle. Next week is the big launch of “normal” Wednesday nights so it is time to raise the bar as we reach and grow. After church I did lunch with my student leaders. It wasn’t an exciting meeting at first glance, just the kick off the year vision/expectations meeting. I just love being around them and seeing their hunger for God and to minister this year. I actually teared up just listening to them pray. I am so excited to see what God will do through them. They are learning and praying to dream as big as God. The second meeting involved Chinese food so you know you can’t go wrong there. I got together tonight with my grace (small) group leaders and simply put I am pumped. This group of people are going to knock the ball out of the park discipling and shepherding our students who take a step toward growth from our Wednesday night gathering. I am excited that I am have the tightest, most focused group of student leaders I have ever had. I am excited that my church has defined so clearly what they want a grace group to look like. I am excited that I have a talented, equipped team that clearly knows what a “win” looks like. I am excited because every year I see the vision of Grace Church and HSM getting tighter and tighter and more life change happening. I just found the link to it if someone would want to buy a copy. Check it out here, and other hits by rising stars like Doug Kegarise, Tim Clothier, and Brent Saba. Get em now, so when they get big you can say you knew them back in the day! 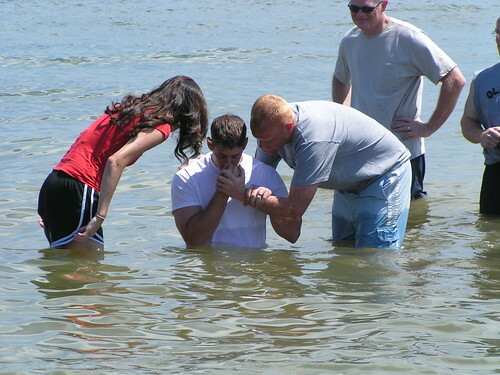 Today at Grace Church we had our annual baptism service and picnic at Alum Creek State Park. My experience with baptism growing up was that it was always done by a pastor and indoors. This is not wrong but I have been so blessed since I have been at Grace Church to see those who were key disciplers or chosen by the person being baptized to “triple dip” em. It is so powerful to watch someone be baptized outside and picture a similar commitment and profession by early believers. I had the privilege to baptize my good friend Luke Reinstetle today and look on as he baptized his wife. They have such a neat testimony how God used health issues to not only bless them with their son but turn them to him. 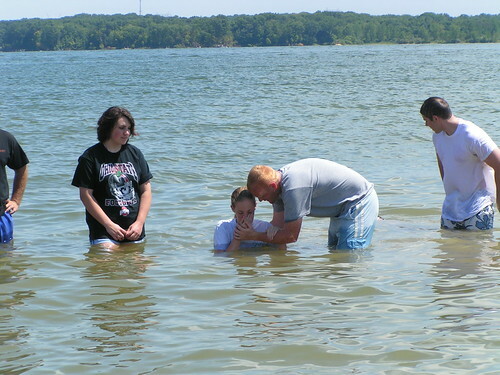 I also got to baptize Taylor Evans. Taylor is a HSM success story who has really grown in her faith and looked to minister to those around her. I am so excited to see how she effects her high school this year.